Indulge with 6 unforgettable nights at this luxury resort, the St Regis Resort Bora Bora, where villas look out over a turquoise lagoon and spectacular sunsets. Enjoy the lush unspoiled surroundings, pristine blue waters and breath-taking views of Mt. Otemanu. 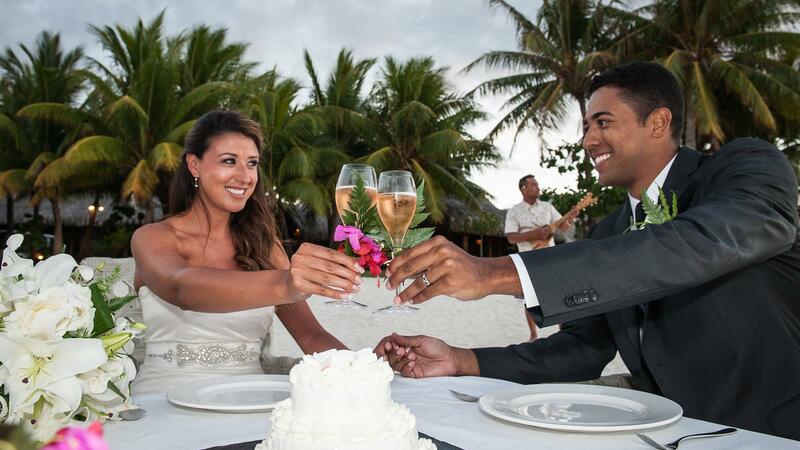 A perfect setting to say “I Do”, your package includes a Tahitian Wedding or Renewal of Vows Ceremony and awaiting you in your villa: a Romantic Bed of Flowers with the Chef’s Sweet Treat of the day served with Champagne. During your stay enjoy a 50 minute Polynesian Couples Massage at the resort’s spa. Package also includes Full Breakfast daily, a Tahitian Black Pearl for the Bride, International and Inter-Island Airfare and Airport Transfers. Dinner at Bloody Mary’s Bora Bora, Shark & Ray feeding Bora Bora, 4WD Bora Bora. For a complete list of recommended Excursions on Bora Bora, please refer to the Excursions page and include your preferences on the Quote Request Form. •	Intimate ceremony conducted on the St. Regis Resort Bora Bora’s main beach with just the Tahitian Priest/master of Ceremonies and the couple in attendance. Includes a Wedding or Vows Certificate. Prices are in US Dollars. All Prices are 'from' per person, based on double occupancy. Single supplements apply. Valid for economy class travel from Los Angeles for select departures between 01 April - 31 May 2019, 01 November - 13 December 2019 and 07 January - 31 March 2020, otherwise supplements will apply. Seats are limited and may not be available on all flights. Must be booked at least 90 days prior to departure. Black-out dates, minimum stay requirements, seasonal surcharges, currency exchange fluctuations, and other restrictions may apply. Government-imposed taxes and fees and carrier-imposed charges are included. Prices may differ when you book your travel and are not guaranteed until full payment is received. All prices are in US dollars and correct at time of posting. All prices, itineraries and routings are subject to change. City tax of approx. $2.00 per person, per night is not included.